"It looks liking picking dicks out of a tree." Even though we don't get to see Hot Tub Time Machine 2 on Christmas Day this year, as was originally planned, the film still arrives in February of 2015, so some time traveling fun isn't too far away. And thus, we have a new green band trailer from across the pond showing just how crazy the adventures get this time. It rehashes some of what we've already seen in the red band trailer from over the summer, but there's also some new stuff, like a montage of some quick, but unseen time traveling experiences for Adam Scott, Rob Corddry, Craig Robinson and Clark Duke. Watch! You can still watch the Hot Tub Time Machine 2 red band trailer right here. 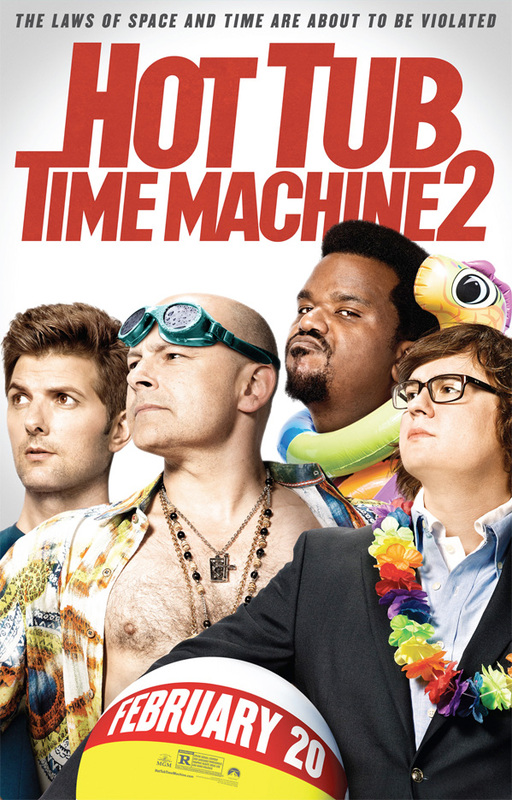 Hot Tub Time Machine 2 is directed by Steve Pink (Hot Tub Time Machine, About Last Night) and written by the original film's writer Josh Heald. This time Rob Corddry finds his life threatened, and he has to travel to the past along with Clark Duke and Craig Robinson in order to save his life. But soon they learn that the time machine doesn't take them where they want to go, but takes them where they need to go. Adam Scott, Gillian Jacobs, Thomas Lennon, Jason Jones and Chevy Chase (but no John Cusack) also star in the comedy sequel which Paramount Pictures releases early next year on February 20th, 2015. Funny stuff here? hashtag pretty much nails it for me too. Should of been a VOD release. This is just starting to look awful. As the RED CHINA HANDOVER massively consolidates -------------as GLOBALIST MAFIA USURPATION -----ramps ---------------------as the 60th Anniversary of the awesomely relevant ------------------------------------KOREAN WAR - - - -is 'overlooked'. Well this trailer had some good jokes in it.